I’ve been reluctant to associate myself with this project for some time, not least because I was arrested before new year and needed to be cautious about the way I intended to proceed until I had jumped through all the necessary legal hoops. This is without doubt the most daring of my protest campaigns, but also the one I feel most strongly about. It’s Christmas 2018. The queen sits in front of a golden piano, on a golden chair, preaching to her subjects about poverty in the UK. Condemned by the UN for cuts to public services and benefits that disproportionately affect the least well-off, the conservative government is in breach of its human rights obligations. The tory austerity narrative has been utterly refuted. Worse still, declared ‘social murder’ by a peer reviewed study from Lancaster University. UCL research links health and social care spending cuts since 2010 to 120,000 excess deaths in England alone. 14 million people, over a fifth of the country are in poverty, with a record 60% of those in poverty in work, the highest figure yet recorded. The governments own research indicates that a shocking 4.1 million of those in poverty are also children. As the brutal impact of DWP policy on the lives of people close to me and thousands more becomes clear, witnessing first hand the turmoil created by a regime of devastating sanctions and chaos over the switch to universal credit. Seeing the pain and unnecessary suffering brought to bear by this government upon the most vulnerable in our society, it’s safe to say there’s something sinister going on in this country. At a time when disability benefit claimant suicide rates have doubled to 43%, nearly half! 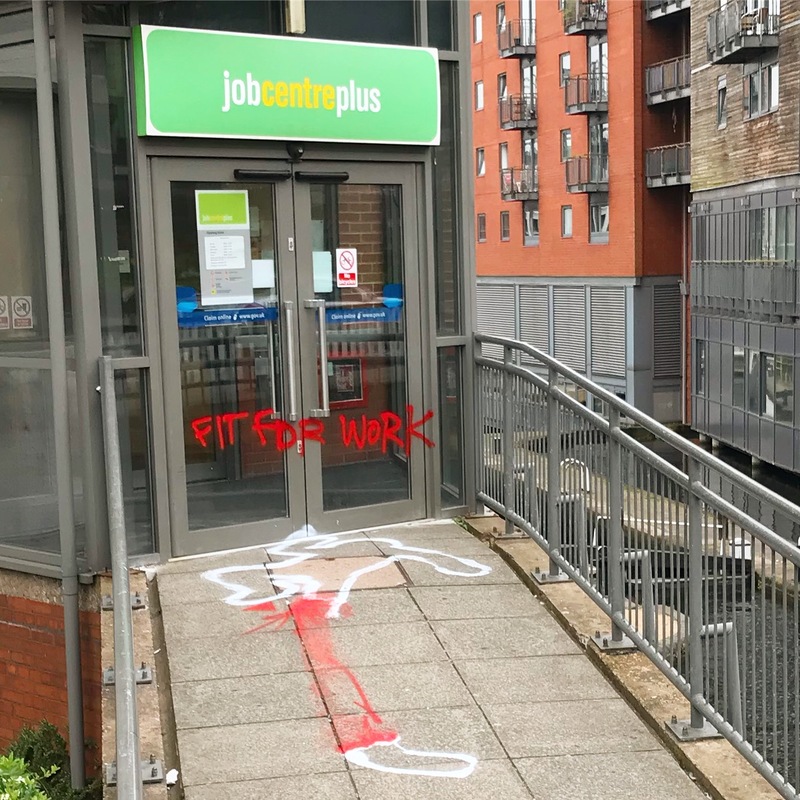 When the disabled and terminally ill are being declared “fit for work” in the face of overwhelming medical evidence, there is no question that this is an ideologically driven program of social cleansing. 70% of appeal cases are subsequently overturned, wasting thousands in unnecessary legal fees, as claimants are sanctioned starving or freezing to death in their own homes, DWP officials are claiming 44 million in performance related bonuses. When homelessness is a crime, when poverty reigns on the streets of one of the richest countries on the planet. When homelessness has risen by a shocking 165%, and people are freezing to death on the steps of parliament, it’s time for immediate action, not platitudes about “strong and stable leadership” or any of the countless sound bites regurgitated in parliament or the media to avoid answering for their criminal legacy. Public opinion must make it clear that we will not accept this! When our elected representatives outright lie to both the public and parliament with impunity. After repeated scandals, U turns and systemic failures, conflicts of interest, and the first government in British history to be found in contempt of parliament, they laugh and jeer when questioned about the impact of leaving the life opportunities of a generation in tatters. No mandate to govern, no real majority within their own party, let alone parliament, desperately clinging to power through bribery, deceit & electoral fraud. Compassionate conservatism laid bare. It is against this backdrop that on the 21st December 2018 I took it upon myself to paint FIT FOR WORK in 40 metre wide letters across the front windows of the Department for Work and Pensions. They’ve tried to cover up these protests in the past, as if that would in some way hide the reality of their savage policies. A metaphor for how they’ve ignored the real human toll of their actions. So it needed to be said much louder! I was ultimately caught mid operation and only managed to get part of the slogan up, and there’s a video link of the police chase at the bottom of the page if you fancy a laugh, but this statement still begs the question, what is this institution “fit for”? I was given a caution for criminal damage, conditional on the attendance of a victim awareness course and a fine of £60. The suggestion that the victim in this situation is in any way the DWP is scandalous! The crass insensitivity demonstrated here is frightening. Yes, I could have been punished more harshly, and I accept that. I thank the police for dealing with me in a respectful way, despite cuts to their own funding that have left them threadbare and completely under resourced, which was why I was taken to Oldbury, because they were understaffed everywhere else. However, this country has a rich history of protesting that has lead to many of the freedoms we enjoy today, and it is our collective responsibility to stand up against these gross and systemic violations of peoples fundamental rights. It was infuriating to hear the police defend the DWP with statements like “you can’t fight the system”, “what’s the point?”. I explained how many of the most disgusting crimes in Human history were legal, from slavery to the holocaust, and that our government was complicit in mass murder, but I wasn’t about to change any minds. They exist to protect the very system I was fighting against. I’ve not long completed the victim awareness course, that was meant to help me “gain an understanding of the effects of my behavior and learn to make informed decisions that will reduce my risk of re-offending”, but all it did was present me with an opportunity to discuss what real victim-hood was in a room full of people who ultimately congratulated me for my work, and suggested I should run for local MP. I think it’s clear from what has already been said here, that this was by no means an ill-informed decision. I would readily give up my liberty if I felt that it could in some small way make a difference. So, will I re-offend? Until this villainous scum are either removed from office, or brought to justice, I’d pretty much promise it! For the future I’ll be working with The Hemp Trading Company to bring the Fit For Work concept to a series of T-shirts where 100% of the profit from these designs will go to charity, but I need your help. I’m selling Fit For Work sticker packs in store now as a means to both fund future protests, and so that you too can get involved! As we move toward what I see as an inevitable general election, we must make sure that issues like this are at the forefront of public conscience when considering who to vote for. We can not endure another 3 years of crippling austerity under the tories.